We consider our store to be the premier purveyor of the inimitable work of MacKenzie-Childs. Our store is known for its extensive inventory of the Complete MacKenzie-Childs Home Collection. Newly engaged or looking for the perfect wedding gift? 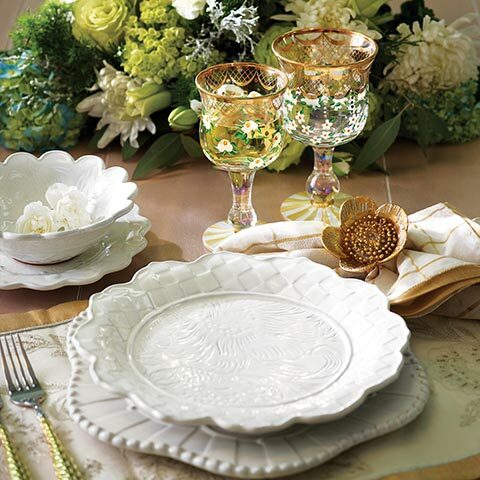 Cornelia Park would be honored to have your Bridal Registry. We can offer you inspired assistance as you plan for your future home and table. Our team would be delighted to work with you to create your registry personally from tip to toe OR you and your groom can do your entire registry online in the comfort of your home. Unexpected new additions show up here. Have some fun ……Take a look….. 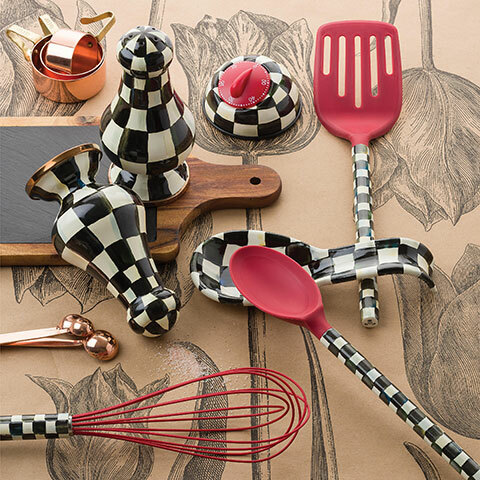 The latest and greatest from MacKenzie-Childs will surely be worth your browsing time. You may even find some “on-line” only items! The hostess gift is an important category at Cornelia Park. For over 30 years our mini salt & peppers have popped up in homes from Arcadia and North Central to Paradise Valley. Mix and match size and color to delight every hostess. They are the perfect “meeting the future in-laws” gift! A set of friendship quotes on coasters or our Courtly Check cocktail napkin caddy are a lovely way to say “ Thanks for dinner”. Grandmother tested books, bibs and baby backpacks are all sure to delight even the most spoiled children! The perfect “Lovie” , a magical unicorn or a talking Mother Goose will make your gifts the most admired at showers or new baby visits. We specialize in send along treats for the siblings when new babies are receiving all the attention. We always have gifts that engage and delight your children or grands. The book “How to Babysit a Grandpa” is a favorite for Papa’s to give! “What To Do With An Idea” is Anne’s favorite gift for kids from 5 to 55! If you want to touch a heart or crack a smile these selections are sure to let someone know you care. Sterling engraved jewelry, quotes on coasters or tiny blessing bracelets are all memory makers. A trinket tray with a message for a dear friend or mom is a great forever present reminder of your affection or gratitude. A certain timeless style is the hallmark of Cornelia Park. It’s hard to define, but classic good design punctuated with surprise is what customers have come to expect. Cornelia Park is home to the world’s most extensive independent collection of MacKenzie-Childs pottery, glass, enamel, rugs and furniture. Cornelia Park, originated at Biltmore Fashion Park in 1980 and has served Phoenicians for generations. Anne, David and the stellar CP team have made Cornelia Park a destination shop where customers and sales team take joy in knowing each other by name. The Parks take pride in the fact that that many of the brides we register today are granddaughters of our first customers. The tradition of Courtly Check under the Christmas tree and beautifully wrapped wedding and shower gifts has become central to birthday, anniversary, hostess, and baby gift-giving for our family of customers. Catstudio’s enormous selection of collegiate pillows and travel destination dish towels are an ever present solution to the graduation, hostess or bon voyage gift. MacKenzie-Childs, our core brand, is a backdrop for a host of timeless brands such as Juliska and Mary Rose Young and Simon Pearce. In addition to an ever changing collection of tabletop brands, you will find a curated variety of jewelry such as Julie Vos and Gypsy. Ben’s Garden and Sugarboo round out our inspirational gift selection. Baby and child gifts of Jellycats, Little Giraffe and book favorites are among our most loved selections. Get news about new products and fun stories about decorating! Get news about new products and fun stories about decorating straight to your inbox! Thank you! Expect something sweet soon in your inbox!